It’s always so much fun to be in Louisville this time of year. 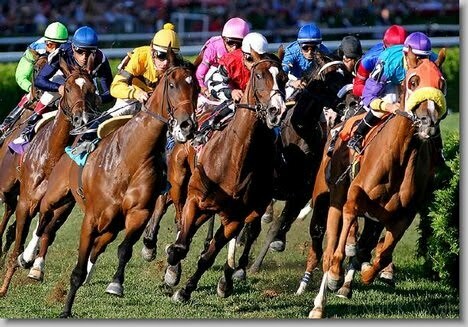 The weather gets warmer, the trees start flowering and Kentucky Derby fever is in the air. For two weeks Derby events are everywhere in the City of Louisville and Jefferson County. Fresh Chef Experience had our first Derby event this past Saturday, April 26, at Mall St. Matthews Williams-Sonoma. We had a great cooking event in the store where we prepared delicious food perfect to serve on Derby Day. A fun crowd enjoyed Fresh Chef Experience’s Derby dishes – Ky Bibb salad with goat cheese, toasted walnuts, dried cherries and walnut oil/bourbon vanilla sorghum vinaigrette, grilled flank steak with a bourbon/green peppercorn sauce and Ky sorghum grits. We even gave away a derby gift – a set of 10 prep bowls! 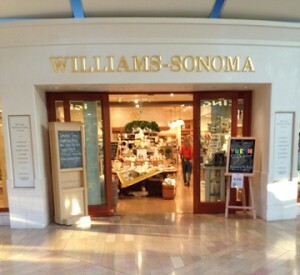 Additionally, it was a special pleasure to be able to cook at Williams-Sonoma with locally grown ingredients and support our local food producers. Our Fresh Chef Experience/Williams-Sonoma event used local products: Weisenburger Grits, Grateful Greens Bib Lettuce, and Kentucky Bourbon Barrel Foods sorghum and bourbon vanilla sorghum – YUM! Fresh Chef Experience continues Derby Week with an event on Friday morning May 2nd. I will be preparing a special Kentucky Oaks Brunch for several guests at the beautiful home of Martha and Ron Wolford. This brunch was part of a package sold at auction last year at the prestigious Julep Ball to benefit the James Graham Brown Cancer Center. Fresh Chef Experience is proud to participate and support this noble cause. More details will follow on this later this week! Wishing everyone a safe and fun Derby Week! Wow, what a week for Fresh Chef Experience! We are so fortunate to have connected with the great managers at the Williams-Sonoma in the Mall St. Matthews, Louisville. Sue was so kind to invited Fresh Chef Experience to entertain and cook in their beautiful store for the next couple months – what a treat! Chef Stu and I will be showcasing a delicious Derby meal on Saturday, April 26th, and we will be there again on Saturday, May 17th. Both Saturdays we will be fixing delicious food to sample, giving away a great door prize, and meeting and greeting everyone in the store. Come on out and join us, we would love to see you! One of our most recent Fresh Chef Experiences focused on getting quick meals on the table for the family. Debbi hired Fresh Chef Experience for a private cooking lesson featuring ideas she could use for making pasta for her sons. After reviewing Fresh Chef Experience options, Debbi chose to learn Rigatoni with Green Olive-Almond and Asiago pesto and Torcelli with Almond, Pistachio and Pecorino Romano pesto. 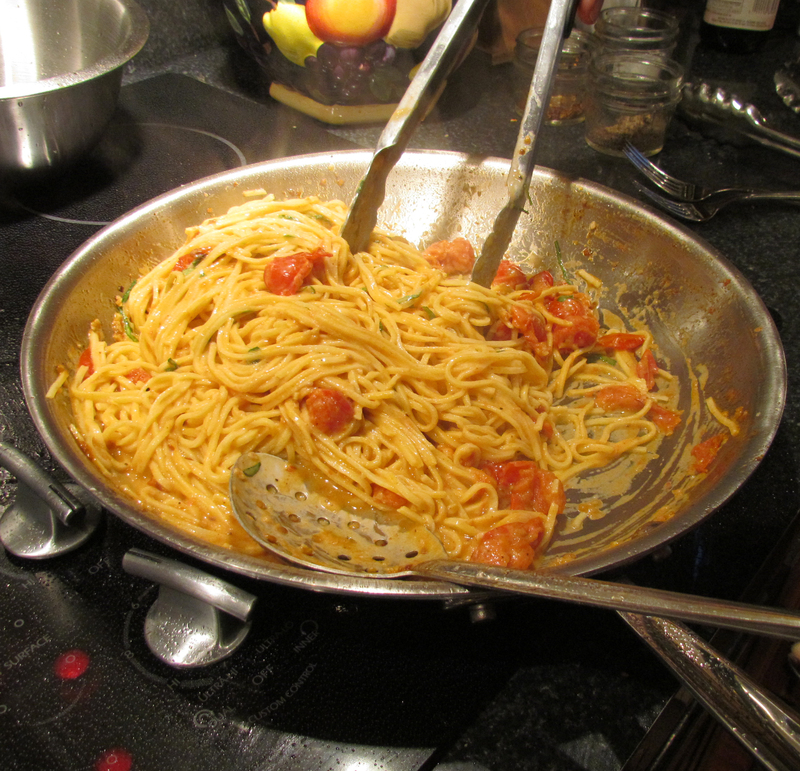 She also chose a quick stovetop tomato sauce -Blistered Cherry Tomato Sauce with Fresh Spaghetti and Grilled Chicken – as her third recipe. Pesto is perfect for getting fast meals on the table. 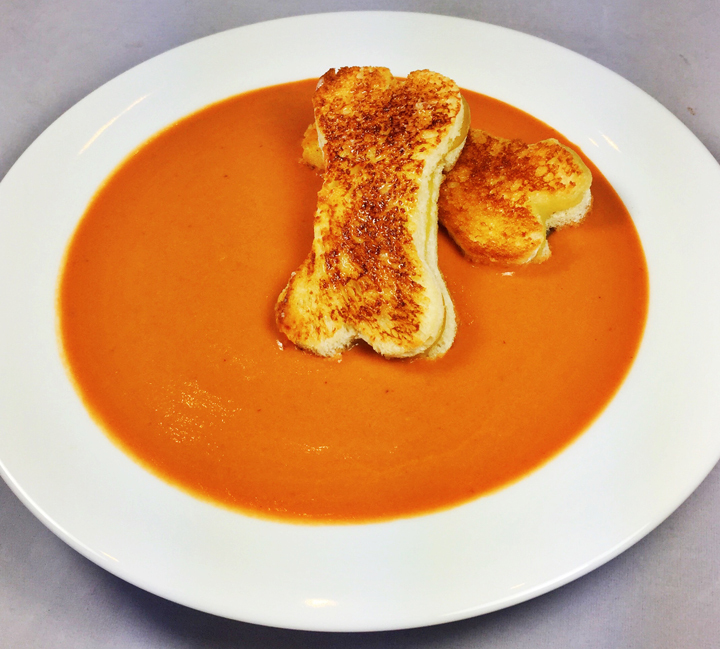 Using just a food processor, you can literally pulse together a quick tasty thick sauce in minutes – no chopping required! Then by simple adding a little pasta water, pesto can quickly become a delicious sauce for pasta. The flexibility of pesto is nice as well since you can use different herb bases to add more variety. Since Debbi has an herb garden in the summer, she loved the idea of taking her fresh basil or parsley and creating a quick sauce. 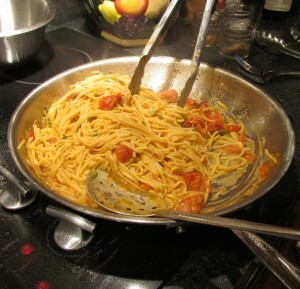 Quick stovetop pan sauces are great for pasta as well. The Blistered Cherry Tomato Sauce was done in minutes and by simply added it to spaghetti it made an easy “kid-approved” meal. Grilled chicken can be added for additional protein or left off entirely for a meatless dish. Below is Debbi’s blistered tomato sauce in the works. Great job Deb – it tasted delicious and the boys loved it!